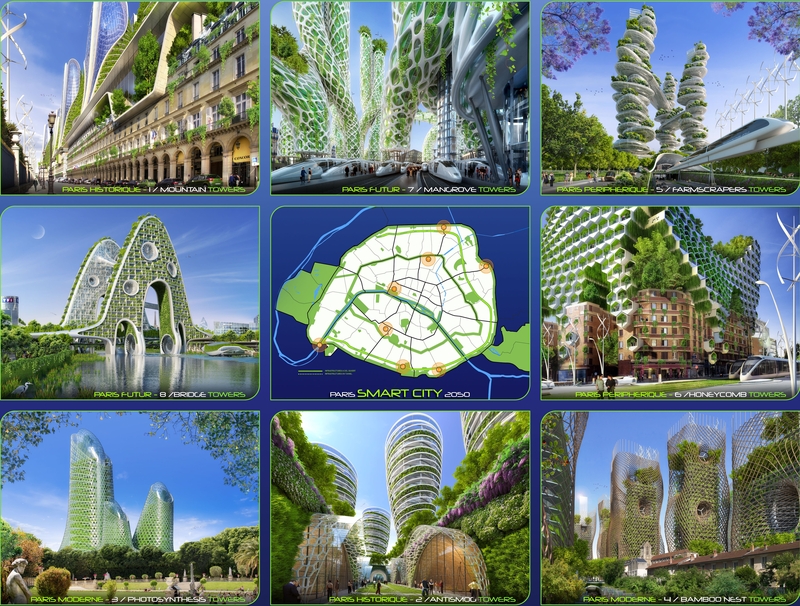 Design Trends Editor Johnny D unravels the futuristic vision of Vincent Callebaut’s 2050 Paris Smart City Project. 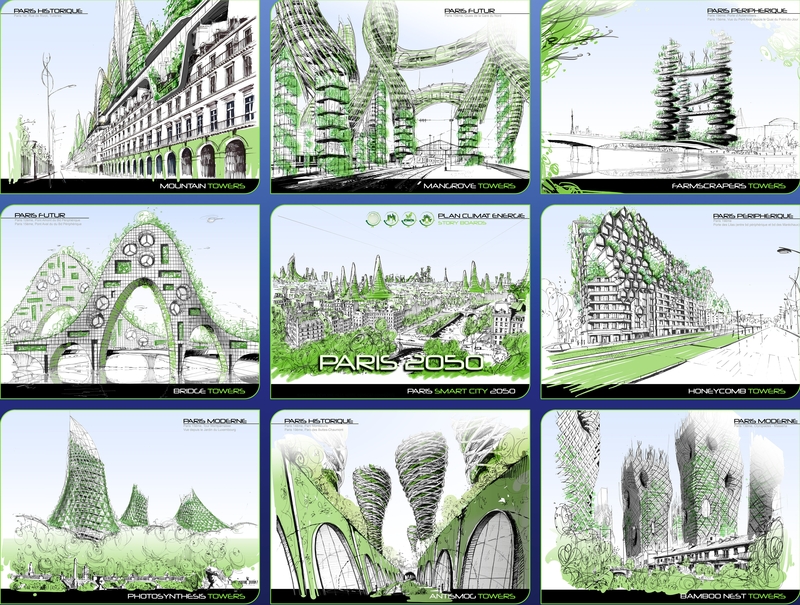 The visionary project has been envisioned and designed by the Paris-based Lead Archibiotect after an in-depth research studying various factors along with Setec Bâtiment agency of engineers in the year 2014 for Paris City Hall. 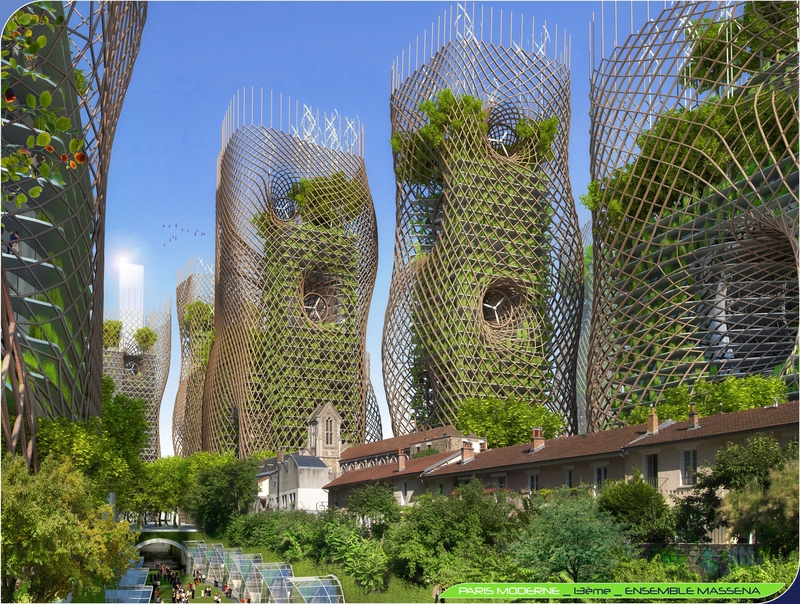 This Two-Part Series will describe the design elements and the process for a sustainable, dense and connected city for 2050 Paris Smart City. 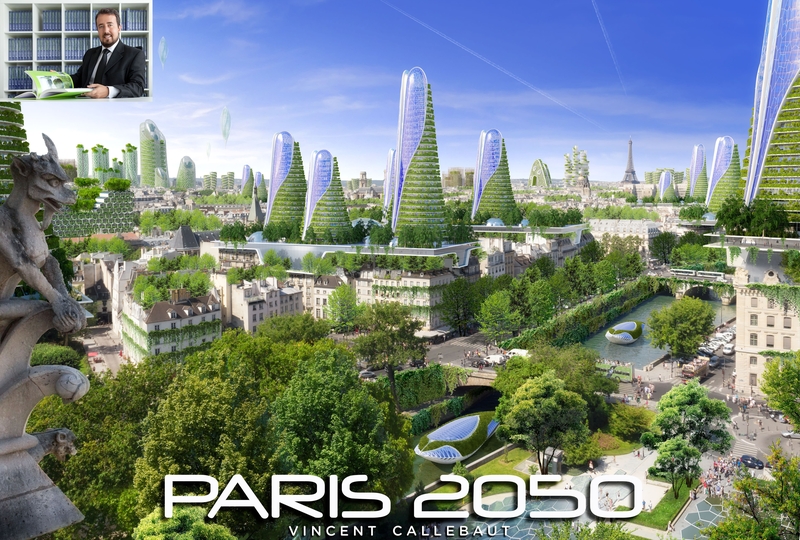 The “2050 Paris Smart City” project is an extensive work of research and development on the integration of high-rise buildings with plus-energy producing by solidarity all together energy for the surrounding areas. The main aim of this ambitious project is to reduce almost 75% of the greenhouse gas emissions in Paris by the “Climate Energy Plan of Paris”. 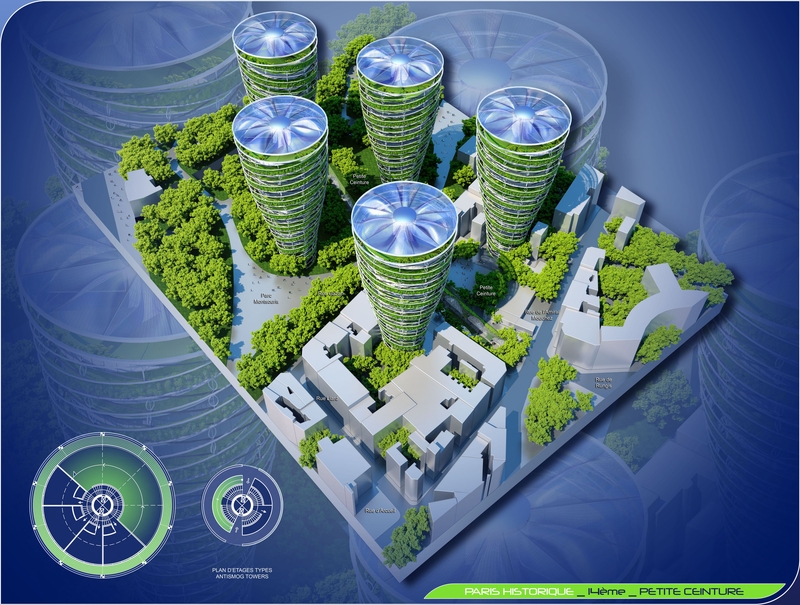 8 prototypes of mixed towers will be designed to reduce the urban heat-island phenomenon by increasing the density of the city in the long-term. 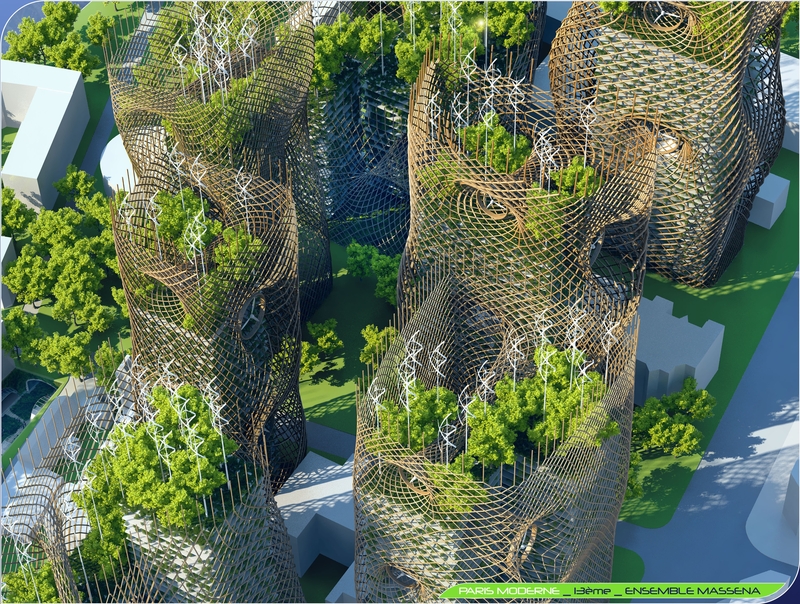 By designing the first eco-responsible ways of life to the quality of life in respect of the environment, the archibiotect has turned to ‘New Social Innovations’. The Mountain Towers question the historic Paris, especially the Rue de Rivoli, why the city has remained to become only a Museum City or to ‘Gentrification’? Lack of political ambition and with no visions for the future, the magnificence of Paris has been condemned. Napolean Bonaparte had built the prestigious Rue de Rivoli Street, dedicated to luxury during his ruling. The grandiose rigour of the neoclassicism in its elegance – Rue de Rivoli is popularly known as the ‘Wall Street’ of Paris. The model of Rue de Rivoli was designed in the 18th Century and later extended to all new Parisian streets. Architects and Artists feel the standardization created a ‘stifling monotony’. 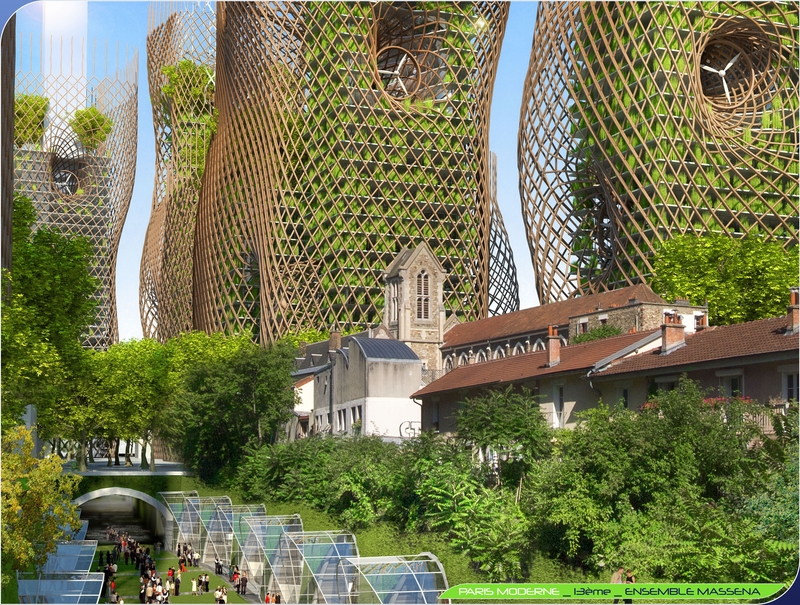 The Mountain Towers will enable to triple vertically the housing in each Parisian housing block by distributing the structural loads through the old ducts of blocked chimneys. 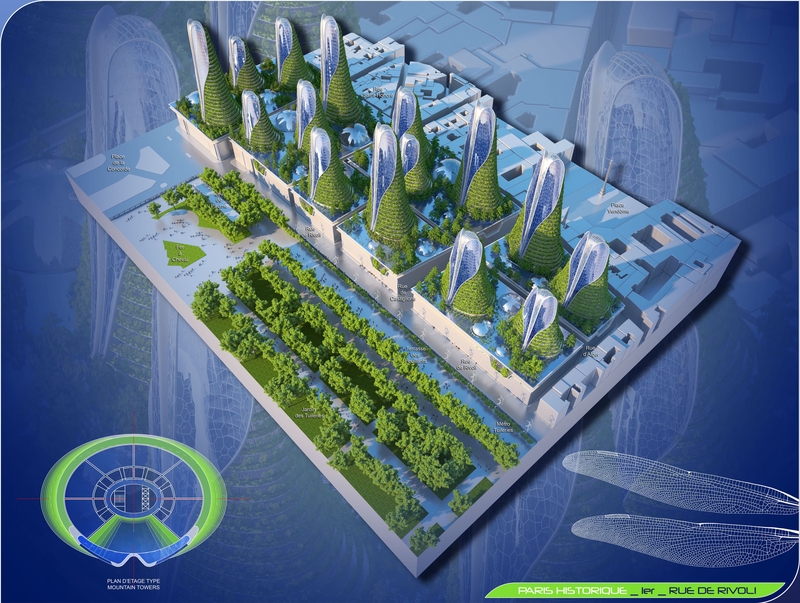 This way smog will be controlled by the construction of bioclimatic mountains integrating the renewable energies on the roofs and in the heart of the block. Two huge photovoltaic and thermal solar shields inspired by the structure finally cut from dragonfly wings will produce electricity and hot sanitary water. Preventing the need of batteries to store the electricity produced by the solar dragonfly wings, at night, a reversible hydro-electrical pumped storage station will let an urban cascade flow out from the top of the tower in between to ‘basins of rainwater’ retention tanks of different levels. 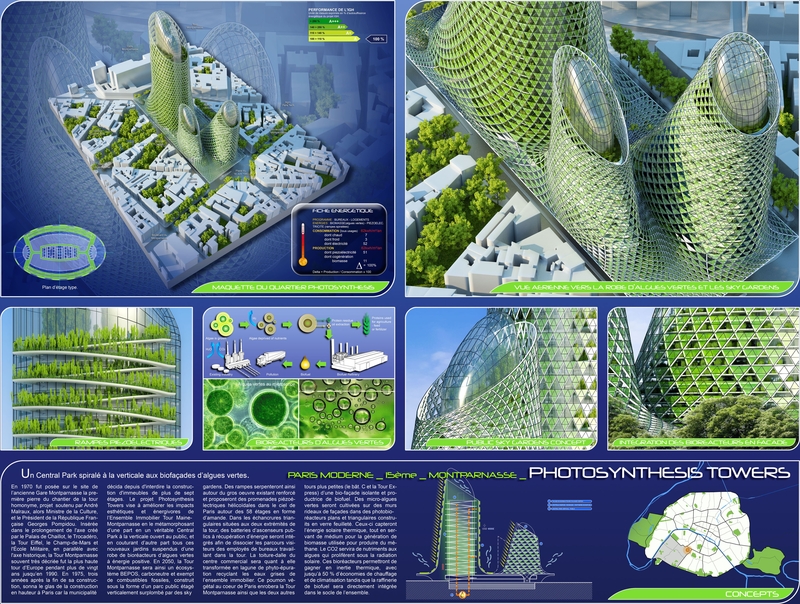 Phyto-purification and bio-composting will be achieved by the garden balconies. 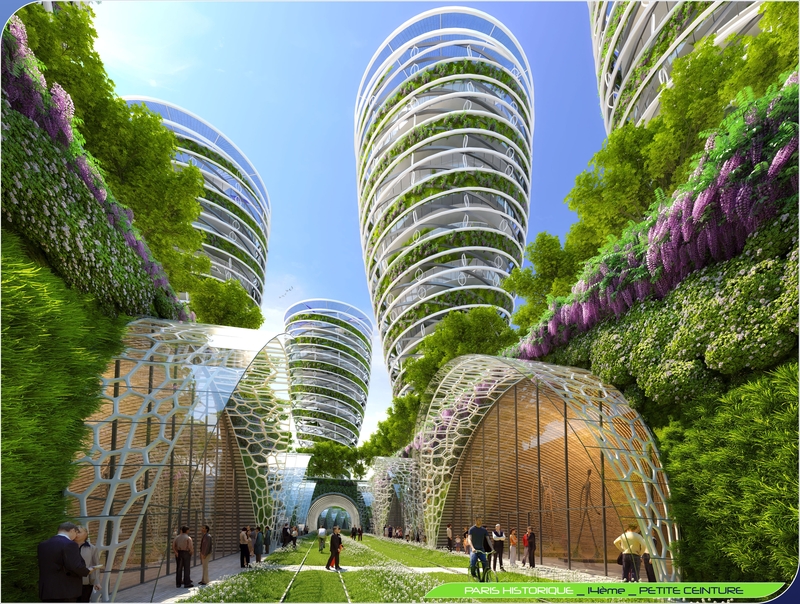 It will surround the inhabited storeys to filter in clean recycled water rejected by the inhabitants. Re-naturalization of the railway lines, the 32-km-stretch of the Petite Ceinture of Paris, into green areas by integrating the residents to cultivate community food gardens. 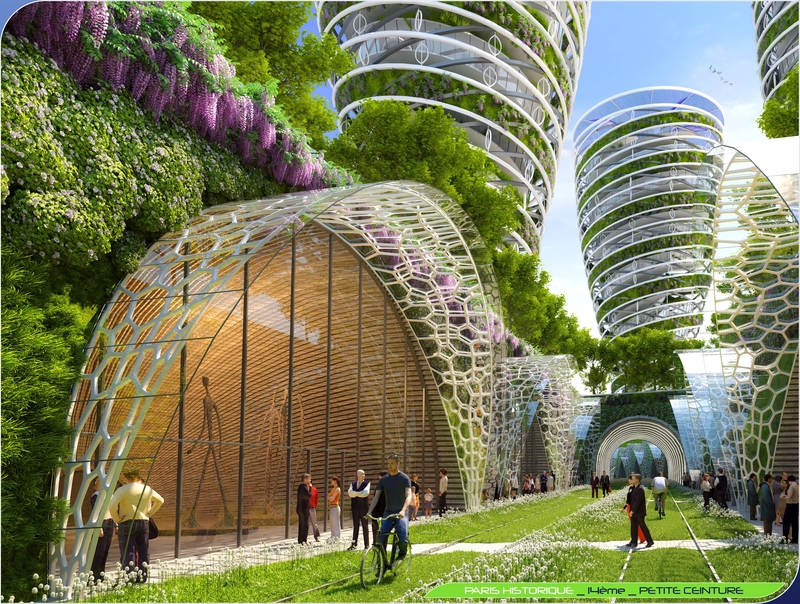 The urban vegetable gardens and the cycle paths will be vertically implemented around the cyclonic towers filtering the atmospheric smog by de-polluting the grounds by hydroponic phyto-purification. 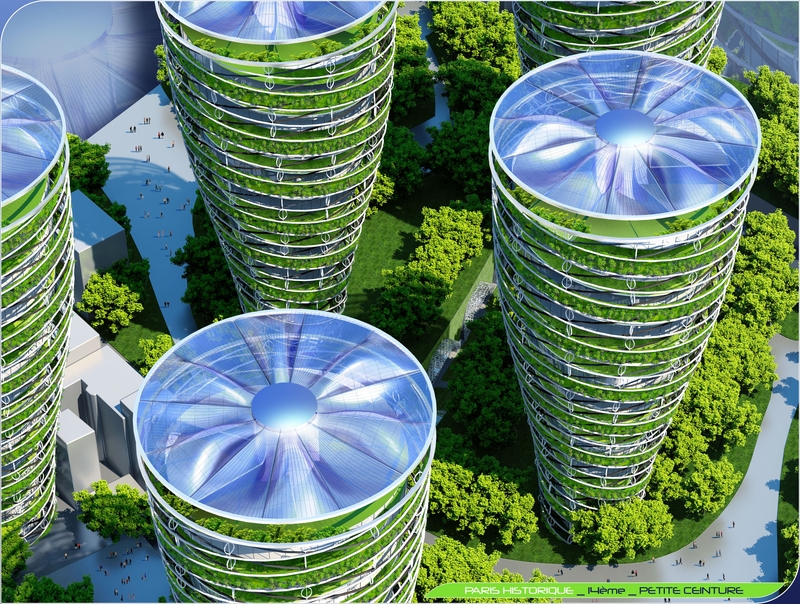 Housing will be cultivated to provide strong urban density with spread out architectural designs by these de-polluting towers with their minimal impact in the ground. At the geographical crossings between the radial Parisian boulevards and the Petite Ceinture, they will be integrated all along the existing ecosystem simultaneously. The integrated axial wind turbines of Darrieus type will produce electricity. 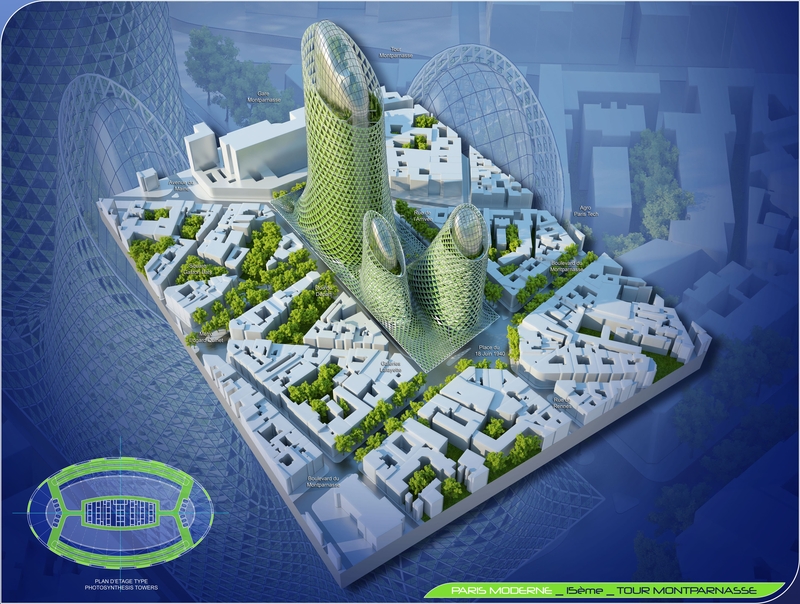 On the other hand, photovoltaic flexible textile will enable the rainwater and the dew on the roof to strengthen the façade of these towers. The tunnels of the Petite Ceinture’s differential temperature will be converted to geothermal cooling or heating tubes by enabling bio-air condition passively the surrounding air inside the towers. Piezoelectrical promenades will light these tunnels. In 1975, the Municipality of Paris restricted construction of buildings with more than 7 floors. 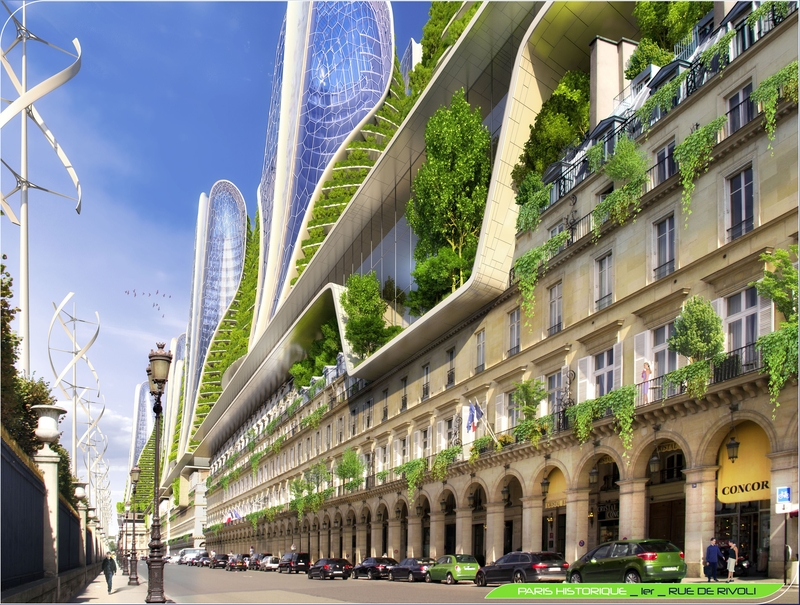 Montparnasse Tower will be transformed in a true vertical Central Park with added new suspended gardens of green algae bioreactors with positive energy. 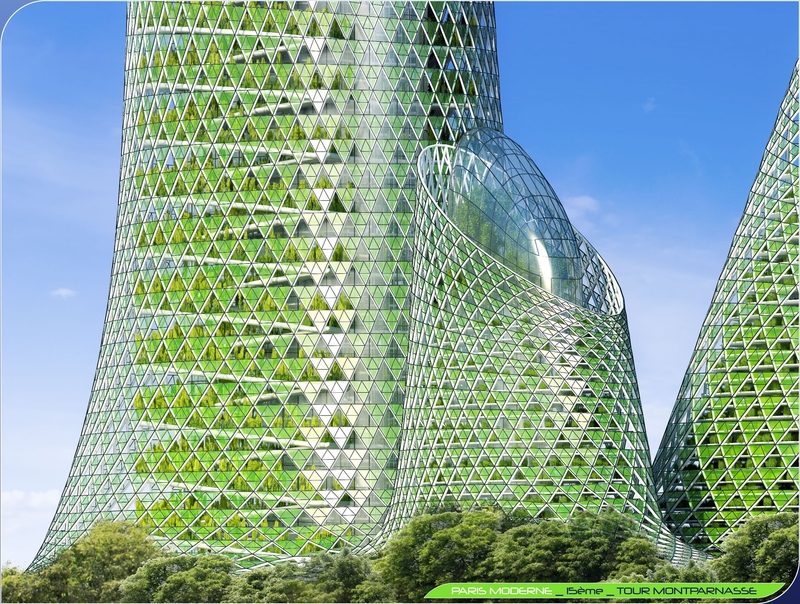 The Photosynthesis Towers will improve the aesthetic and energy consuming impacts of the Montparnasse Tower. 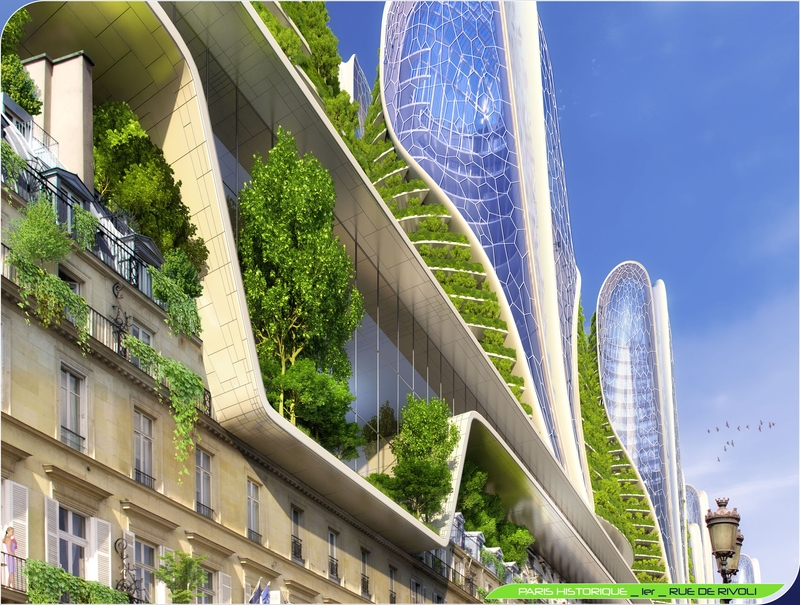 By 2050, Montparnasse Tower will become a carbon neutral BEPOS ecosystem without fossil fuels built under the shape of a vertical public park on several floors overhung by sky gardens. The design of helical piezo-eletrical promenades in the sky of Paris around the 58 floors in the shape of almond will be created by banisters, which will be meandered around the reinforced structure. 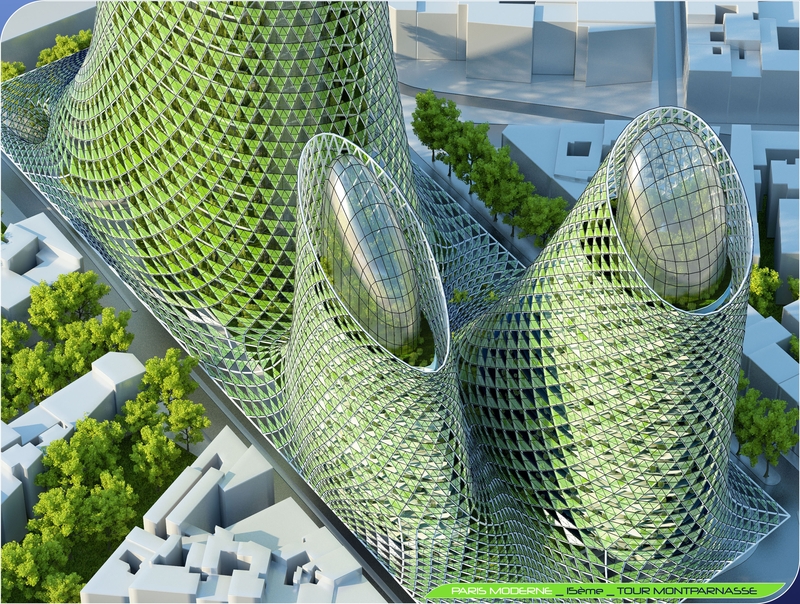 Public elevators with renewable energy will be integrated at both extremities of the tower in the triangular openings. It will separate the visitor ways from the staff working in offices of the towers. A phyto-purification lagoon recycling the used water of the building will be transformed on the slab-roof of the shopping mall. Green micro algae will be cultivated on curtain-walls in planar and triangular photo-bioreactors built in laminated glass. These bio-reactors will improve thermal inertia up to 50% of heating and air-condition saving, simultaneously, the bio-fuel refinery will be directly integrated in the base of the building. 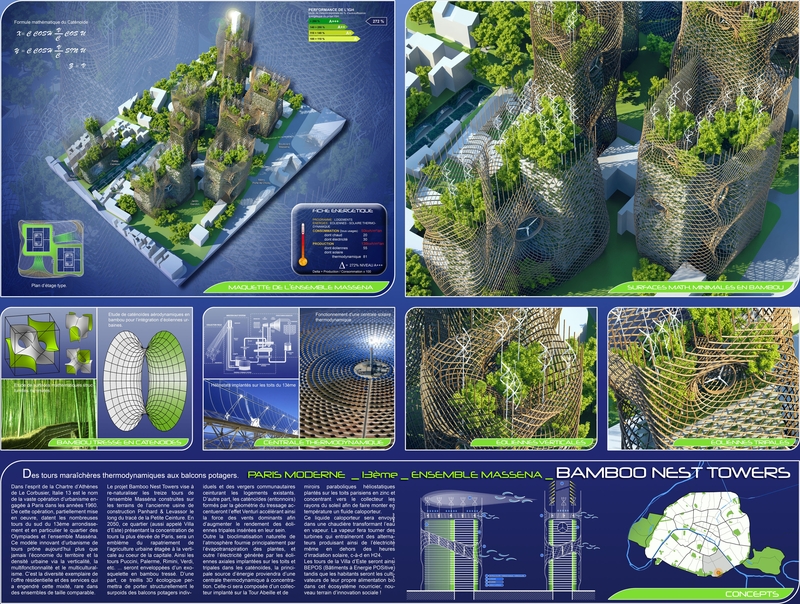 Re-naturalization of the 13 towers of Massena area built on the grounds of the former Panhard and Levassor Plant along the way of the Petite Ceinture is the main of the Bamboo Nest Towers. By 2050, this district, Villa d’Este, will become the emblem of the repatriation of the urban vertical agriculture on several floors in the heart of the capital city. This district will present the highest concentration of towers in Paris. Eco-skeleton in plaited bamboo will be enveloped around the Puccini, Palerme, Rimini and Verdi towers. The ecological 3D canvas will enable to support structurally the overload of individual vegetable garden balconies, community orchards surrounding the existing housing. On the other hand, the funnels shaped by the braiding geometry will accentuate the venture effect accelerating the strength of the prevailing winds to increase the output of the three-blade wind turbines. The main energy source will come from the concentrating thermodynamic plant. This will be composed of a collector implanted on the Abeille Tower and parabolic helio-static mirrors planted on the Parisian zinc roofs. These will be concentrating towards the collector for the Sunrays to increase the temperature of a heat transfer fluid. This liquid will transform the water into steam in the water heater. The steam will make the turbines turn, which will pull the alternators producing electricity even outside the solar irradiation time 24 x 7. 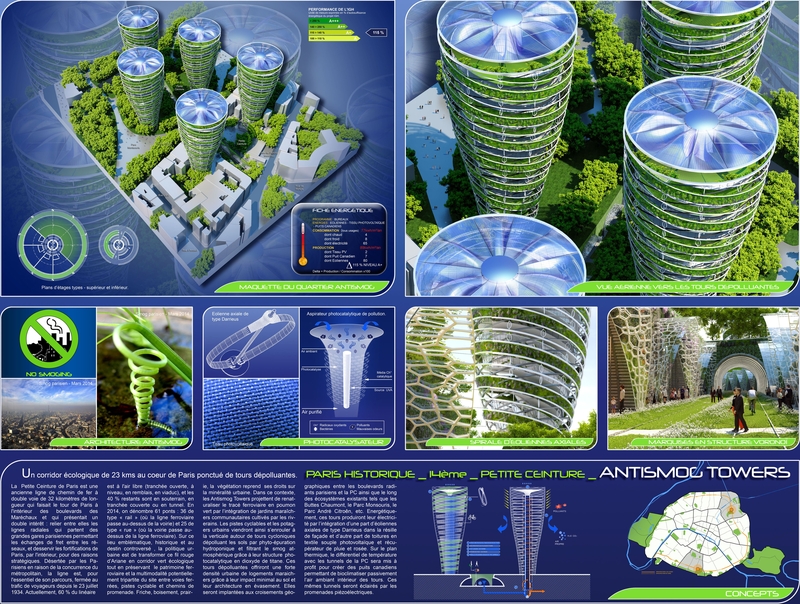 The inhabitants will cultivate their own organic food in the nourishing ecosystem of the towers of Villa d’Este. BEPOS – Building with Positive Energy is the New Social Innovation Ground.